After adding an image or photo, you may want to change it or alter its properties, such as the alignment or whether or not it has a caption. Open Page Builder in WordPress. Hover mouse over the image you want to change and click the wrench button. Click Photo, then drag and drop the photo box to a place on the page. From the Photo Settings dialog box, use the Photo Source to choose Media Library or URL. 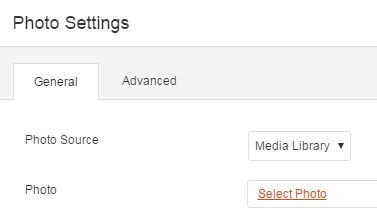 Media Library Click one of the Select Photo tabs to choose a photo and click Select Photo. URL Paste a url into the Photo field. Use the remaining fields in the Photo Settings dialog box as needed. Crop Select the following image cropping options; Landscape, Panorama, Portrait, Square, Circle, or not all. Alignment You can align your image to the left, center or right of the space it resides in. Caption Your image caption can be displayed On-Hover, Below the Photo, or not at all. Link You can link your image to a URL, a Lightbox, Photo File or Photo Page. Click Done located on the top-right corner. Click Publish Changes. If you do not want these changes to go live yet, click on Save the Changes and Exit option. Note: Avoid slow page loads by resizing images yourself before uploading. Server image resizing will cause your site to load slowly. Changing from GD website builder to WordPress?? Problem.